The EU has approved Tutus's VPN crypto solution, Farist, for protecting EU classified information at the level EU RESTRICTED. The VPN solution has been developed by Tutus in a joint project with the Swedish Defence Materiel Administration (FMV) and the Swedish Armed Forces. Farist is a VPN solution that provides secure communication over untrusted IP-networks, making it possible to interconnect private networks over untrusted public networks using encrypted tunnels. "We are very proud that our VPN solution, Färist has been approved by the EU for secure communication. We regard the approval as a confirmation that we have succeeded in our efforts to develop a product with high-assurance security combined with best-in-class performance", says Jens Bohlin, CEO Tutus. Per Holmer, CTO at Tutus adds "Färist VPN will meet any requirements when it comes to a secure, cost-effective and future-proof VPN solution. Key aspects of the design of Färist are high security and user friendliness combined with scalability and market leading performance. Färist is available in a variety of sizes, from small mobile units to high performance rack mounted systems. VPN performance ranges from 100 Mbit/s up to 1 Gbit/s and will increase over time as faster hardware becomes available". Within the Swedish Government and the EU administration the approved version of Färist VPN is called SIGRID and also PGAI 9401. Founded in 1992, Tutus Data delivers high-assurance crypto network devices for use in military, government and corporate IT deployments requiring the highest levels of secure communication around the world. Tutus is now the main supplier of government-approved and certified IT security products in Sweden, and is achieving steady progress toward its goal to become the leading provider of Restricted-approved IT security products within the EU. Tutus Färist VPN D200. 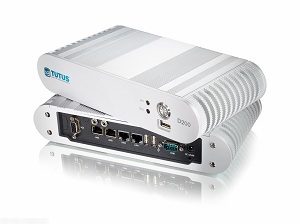 A fanless desktop VPN with 4 Ethernet ports and VPN performance of 100 Mbit/s.